NOSE: Very muted aroma. The malt sweetness smells more like honey or light maple syrup and it’s punctuated with the aroma of lemons, coriander, clove, and yeast. TASTE: Well-balanced, but very bland. A sweet, biscuity pale malt backbone perfectly wed with a fruity, spicy, very mildly bitter hop profile. Nothing dominates and nothing stands out. The finish is crisp, dry, clean, and thoroughly underwhelming. MOUTHFEEL: Good effervescence and a lighter than medium body. DRINKABILITY: It’s actually very drinkable. Light, refreshing, and not overpowering at all. But considering Avery’s awesome track record, it’s a pretty boring brew. I finished the sixer, but I won’t be buying another. 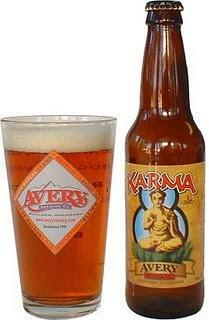 Posted in Tasting Notes.Tagged Avery, Belgian Pale Ale, Karma. Next Post WORLD CLASS IMPERIAL STOUT……FROM CANADA?